Is Your Sunscreen Really Protecting Your Skin? At 46 years old, Jennifer Garner looks as radiant as ever and shares her thoughts about choosing the right sunscreen. This time of year, whether you're enjoying a game of beach volleyball, taking a dip in the ocean, or sipping a margarita while dining al fresco, you're exposed to the sun and its blazing heat. Slathering on sunscreen should really be a part of your daily routine, not just reserved for times spent by the pool or at the beach. Jennifer Garner has been in front of Hollywood's limelight since she graced the screen in her award-winning role as a CIA agent for a spy-action TV series. She has then expanded into romantic-comedies and dramatic roles, and off-screen, she is an impassioned proponent of healthy skin as Neutrogena's brand ambassador. Jennifer shares why protecting yourself from the sun should be an everyday habit: "I didn't know the damage I was doing until I hit 36 years old and woke up and saw sun damage. You don't know that it is happening and you can't always see it." Since then, Garner has made it the core of her morning skincare routine and flaunts her radiant skin: "Prevention is the hardest thing to think of. We all think we can take care of a problem once there is a problem, but if you can just take a minute and prevent, prevent, prevent, it [makes] all the difference in the world." But how do you know which sunscreen to get? Here, we help you scrub up on your sun protection facts, so you know how you can maximize skin coverage from sun damage. Sun protection factor or SPF measures the protection level of sunscreen against harmful ultraviolet rays. The higher the SPF number, the higher the level of protection. For Garner, a mother of three, SPF is non-negotiable especially when it comes to her kids. "They can sit inside if they don't want sunscreen, but if they want to be at the water park, or in the pool, or at the beach, they know that I put sunscreen on before we even leave the house. If you don't and you get a sunburn, it's terrible." Most sunscreens effectively block UVB rays for less than two hours, and UVA protection breaks down shortly after exposure to the sun. But a sunscreen with Helioplex, a formulation for long-lasting protection, gives four to five hours of protection from both UVA and UVB rays. 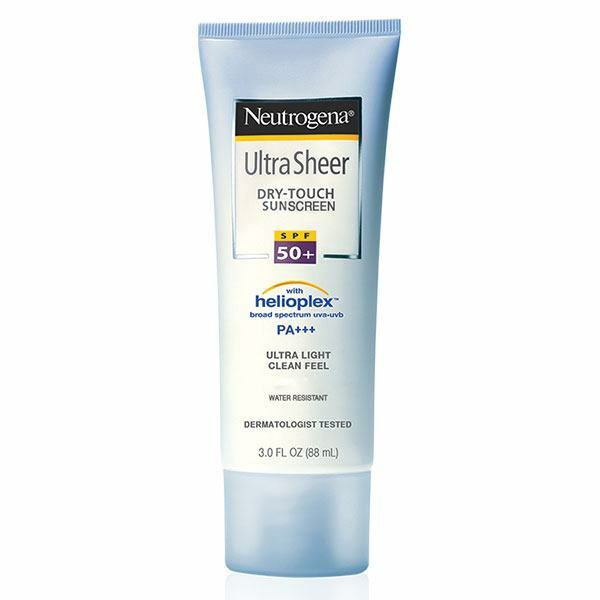 Neutrogena developed and first introduced Helioplex in their Ultra Sheer Dry-Touch Sunscreen with SPF 50 in 2005. This sunscreen absorbs excess oils for a clean, shine-free finish. More importantly, it stays water-resistant for up to 80 minutes and provides powerful sun protection without the heavy finish. Neutrogena Ultra Sheer Dry-Touch Sunscreen Lotion SPF 50 PA+++ is available in Watsons, Rustan’s, The SM Store, and other leading stores nationwide. A water-resistant sunscreen will stay on your skin for just a certain amount of time. Its SPF level typically stays effective for about 40 to 80 minutes in the water, depending on what's indicated on the label. Jennifer applies sunscreen before leaving her home for the water park with her kids to let it sink in, just in time for when they jump in the water. "It pays off because you never have that moment where you have to stay inside for a day." To be safe, make it a habit to reapply sunscreen at least every two hours. A lightweight sun protectant with a non-oily and non-comedogenic formula not only keeps your foundation intact (due to the lack of extra oils) but also prevents your pores from clogging up. In fact, this kind of sunscreen can be a great base underneath your makeup. This is why Jennifer wears it every day. "The thing I really love about Neutrogena Ultra Sheer is that it doesn't clog your skin. You can't see it; it doesn't make your skin greasy halfway through the day. It doesn't make you break out. It is just a really clean, effective, [and] smart way to keep your skin safe." Remember to put sunscreen on a clean face after your moisturizer, and then let your skin absorb the sunscreen before applying your makeup. The two types of UV radiation that damage the skin are called UVA and UVB rays. UVA rays cause premature aging, dark spots, and wrinkles, while UVB rays cause sunburn and, in more serious cases, skin cancer. Not many sunscreens provide protection against both UVA and UVB rays, so look for one with broad-spectrum protection for full coverage under the sun. "I'm a big believer in looking for shade," Garner says, "and [in] all about being protected enough that you can play in the sun and not worry about it." Follow Neutrogena on Facebook to find out more about their products. This article was created by Summit StoryLabs in partnership with Neutrogena.